At Anamaya, we’ve been running retreats since we first openeded in December 2009. 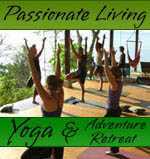 We’ve had all kinds, most of which are yoga retreats, but with a variety depending on the instructors. We wanted to keep them shown here on our website as a record of all the great people who have done retreats here. All of them were great and their students had an amazing time. Our luxurious accomodations, healthy organic food, and sense of exotic style create an intimate and unforgettable experience that our guests rave to their friends about. Just check out our Trip Advisor reviews to see what our guests have been saying about us: Anamaya Reviews. For our current yoga retreats and other retreats, click Current Anamaya Retreats. With Monica Wille from Espana Streb Trapeze Academy in NY. For beginning students (no experience necessary) looking to learn a fun and challenging new art form in a judgement-free environment. Come prepared to work and play hard. In this retreat, you’ll find muscles you never knew you had! With Michele Loew from The Yoga Space. Celebrate growth, cultivate balance, embody sustainability, heal our body, our community, and earth. 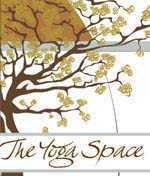 A space for deepening our practice of Yoga. 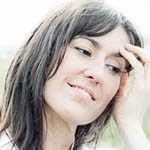 An Anusara-Inspired Yoga Retreat with Daniella Cotreau. 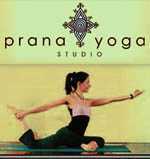 Anusara-Inspired yoga practice twice a day, in the early morning and afternoon. The afternoon session will include journal writing, and talks on the Philosophy of Yoga, plus live music, beach time, a fire dance show, organic food, and plenty of free time. Come to paradise to play, get in touch with nature, and study Aerial Silk, Yoga, and Pilates with Ana Prada, former Cirque du Soleil aerial acrobat. An active retreat in a relaxed,friendly environment focusing on discovering the air, taking inspiration from views of the ocean and jungle & being playful while getting a great workout. Plan to leave feeling renewed, re-inspired, and re-energized! Recharge your energy and spirit! Experience all the best that Anamaya and Costa Rica have to offer with our Costa Rica yoga retreat package designed for adventurous spirits who are interested in exploring our beautiful country. Your trip will include plenty of yoga, all organic food, a canopy tour, and plenty of beach time on some of the world’s most spectacularly beautiful beaches in the Montezuma and Malpais areas. Relax and enjoy some of Costa Rica’s most beautiful beaches in addition to your daily yoga at Anamaya. As always, you will be served our amazing organic food, enjoy the waterfall nextdoor, our amazing infinty pool, and Anamaya’s exotic style. Click here for more details about this fabulous and affordable retreat. 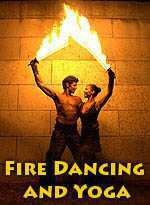 September Yoga and ZUMBA Dance Retreat! We are so excited about this retreat! 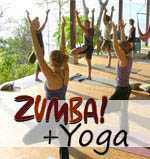 This is just like our regular yoga retreat package, but with Zumba Dance in addition! Zumba is a super fun latin/hip-hop dance that’s easy to learn and great aerobic excercise. This, combined with Yoga, plus our healthy organic food is sure to get your body, mind, and spirit humming. Remember, bring a friend and receive $100 off for each friend you bring! 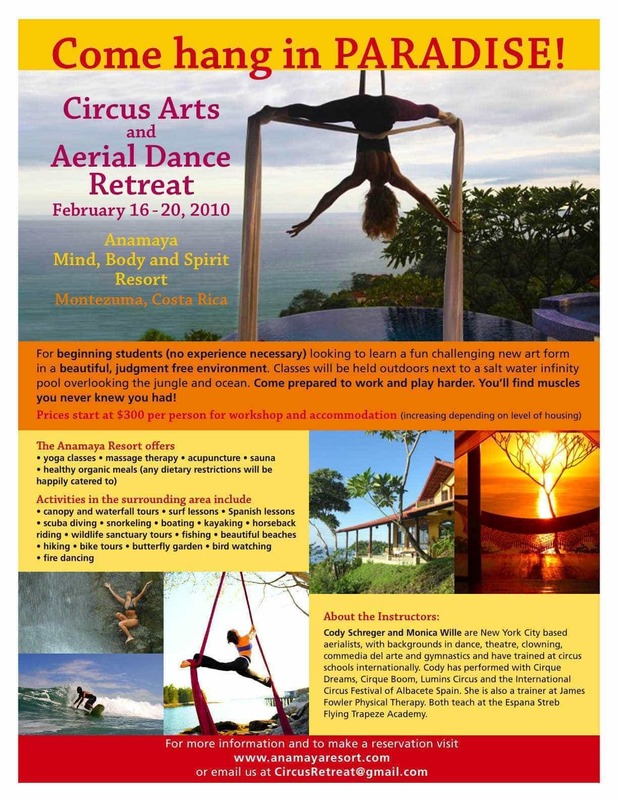 Journey to the rainforests and beaches of Costa Rica to play, get in touch with nature, and study Aerial Silk Dance, Yoga, and Pilates with Ana Prada, former Cirque du Soleil aerial acrobat. 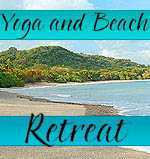 This will be a fun, active retreat in a relaxed and friendly environment focusing on discovering the air, taking inspiration from views of the ocean and jungle & being playful while getting a great workout. Plan to leave feeling renewed, inspired, and energized! $1195 all included. Registration via Anamaya. 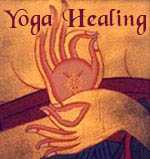 Yoga and healing with master teachers Juliana and Enrico. 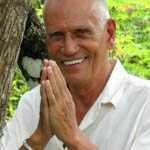 This very special retreat will include twice-daily yoga classes with both teachers, along with personal healing sessions with Enrico. A special meditation and yoga retreat with Janice Gates (Yoga Garden Studio) and Mark Coleman (Awake in the Wild). Nowhere are the contemplative practices of yoga and meditation more profound and the combination of solitude and community more nourishing than in the primal context of wilderness. This magical nature retreat is the ideal place to rejuvenate and awaken to the mystery and wonder of being alive in the natural world. Please contact the instructors directly for questions and registration: US 415-485-5800. Definitely Anamaya’s most exciting retreat ever! 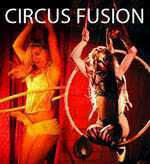 Veteran circus arts performers and instructors Seanna Sharpe and KaytiBunny Roberts, will be teaching a wide range of circus skills: all sorts of aerial arts, hula hoop dance, fire dancing, fire eating, showmanship, and much more, along with daily Yoga and a variety of activities. We can’t wait for this one!!! An Exclusive & Romantic Vacation for Eight Couples with Tantra experience. 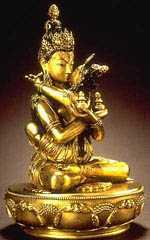 Steve and Lokita Carter will hold their annual tantric retreat in Costa Rica at Anamaya this year. Their unique workshops are for couples who are ready to take the next step towards more aliveness, love, and consciousness in their intimate relating as well as in their day-to-day lives. 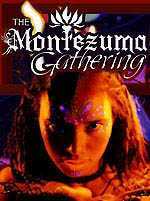 Spend 7 luscious days in Montezuma, Costa Rica, reconnecting with your innate capacity for self-love, inner balance, and peace of mind. 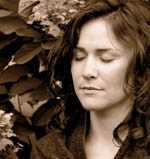 Join Sally as we explore the depths of our body and mind. A special women’s wellness retreat with Nisha Moodley and Paula Orozco. This retreat is for women who are ready to live their life’s purpose and be part of a brilliant community of sisters. Our incredible wellness workshops, relaxing exercise classes, nature journeys and adventure excursions are specifically designed to give you a deeply nourishing and transformative experience and teach you the tools for a lifetime of greater well-being. Please contact the instructors directly for questions and registration at 646-707-2847 (USA) or [email protected]. Join Jennifer at the Anamaya Resort for an unforgettable yoga retreat. 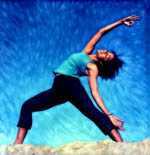 In the mornings we will have a strong flow practice, while in the evenings we will do an optional Yin practice. During your down time enjoy the infinity pool or infrared sauna, or book a massage or other spa service. Anamana is only a mile from the beach, close to waterfalls and hiking trails. Yoga, 3 organic meals a day and accomadations included. For more information email [email protected]. 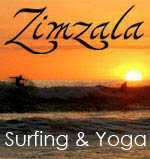 ‘Zimzala’ is the surfer’s definition of a free-spirited person who finds peace with the sand between their toes. In this week-long package, learn how to surf or work to improve your surfing skills. This Costa Rica surf camp retreat also includes daily yoga sessions overlooking Anamaya’s incredible 270 degree ocean views. Experience the power of the ocean along with the calmness of yoga practice in one incredible week. Along with Anamaya’s delicious organic food and luxury accommodations, this will be the vacation of your life! Stay at Anamaya during “The Montezuma Gathering” for $995, which includes a shared room at Anamaya, your food, yoga classes, and a ticket to The Gathering. Do your yoga teacher training in paradise at Anamaya with the amazing Sasha Dae! 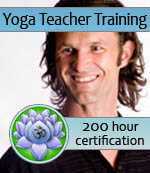 Stay at Anamaya for the whole month of October and get your 200-hr teaching certificate, as well as getting into the best shape of your life, mentally, physically, biochemically, and spiritually. Whether you plan to become a yoga teacher or not, this is a great opportunity to dive deeply into yoga for a month of intensive study. All inclusive prices starting at only $3495! We all need to relax to heal. Each student will have “one on one” radical weight management hypnotherapy to give individual attention to your specific issues surrounding eating. We will work in groups to process emotional eating. The students will be given nutritional education focusing on alkaline and acid based diet, plus educated about Zrii, an aryvedic botanical that helps detox the body of toxins and fat to safely lose 5 pounds a week. This is the best weight management program ever, and you will actually eat lots of gourmet nutritious food at the retreat. Learn how to finally stop the emotional eating, and to begin to create that health you really want. Become a part of the cure for stress and obesity by taking this time to finally lose the unhealthy eating, once and for all. We will cover food, exercise and stress reduction. Dr Cindy has helped 1000’s in Northern California to lose weight, and keep it off. Have the best healthiest vacation ever and come home on top of your health! 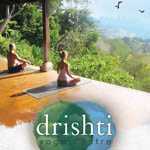 Join Lisa Messina, certified Yoga and Pilates instructor and founder of Drishti Yoga, along with a fine group of adventurous yogis for the 2nd annual yoga retreat to Costa Rica’s exotic Nicoya Peninsua. Step out of your routine and enter an oasis where paradise and yoga unite to create an unforgettable energy. Please contact us for more details regarding our retreats.